Unveiled in a ceremony on Thursday 19 October, Children of the Mediterranean was created in response to the tragic death of Alan Kurdi, a Syrian child refugee who drowned in 2015. Formed from over seven tonnes of granite, the installation is sculpted into 91 figures to represent the percentage of child refugees who make the perilous journey across the Mediterranean unaccompanied in the hope of finding safety in Europe. It has been displayed for the first time on a plinth outside Middlesex University’s newest arts and science facility, the Ritterman Building, which was installed to encourage students and local artists to exhibit their works. In 2015, Middlesex Students’ Union (MDXSU) led a successful campaign in partnership with Citizens UK to lobby Barnet Council to re-settle 50 Syrian refugees in the borough. 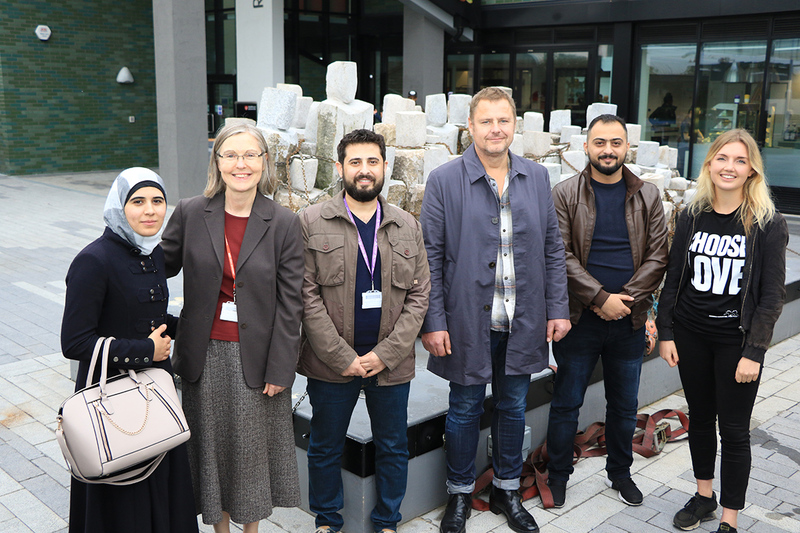 Three of the refugees who are now studying at Middlesex attended the ceremony alongside representatives from the University and the charity, Help Refugees, as well as the installation’s sculptor, Drew Edwards. Speaking on behalf of the University, Diversity Adviser Sayed Alkadiri said that the sculpture was a fitting reflection of the students’ deep concern for refugees and the plight of the Syrian people. “Our students and staff come from all over the world, and we celebrate the diversity of their backgrounds and religions,” he said. "At Middlesex, we aim for our students to encounter different perspectives, beliefs and outlooks to foster both breadth and depth in their learning. Finchley sculptor Drew Edwards said that his work confronts the numbness associated with increased coverage of children fleeing conflict around the world. “It’s media fatigue, and the unforgivable has become palatable,” he said. “I hope this will make people ponder for a moment how privileged we are to live in one of the richest and safest democracies on earth, and perhaps consider how they can help more. The installation is expected to remain in Hendon for up to six months.